When I first saw Google glass, it took me back to 1995 and the release of the action film Terminator 2 – Judgment Day. A bunch of us sophomores got all excited about the movie and went to see it as a big group with much anticipation. The scene that got deeply engrained in my mind was the Terminator Arnold Schwarzenegger entering the bar scene, starts scanning the objects around him to find an outfit that matches his size. That scene became the holy grail of augmented reality: in which a wearable or other device makes the person wearing it by disseminating information about objects in the vicinity in order to add immense value. Imagine going to a trade show and your glasses scanning passersby, providing name, title, company and a mini biography, and maybe more: a glimpse of what problem is keeping them up at night, what goal brought them to the trade show, and what they want to get out of the event. By having this type of information through a wearable device, you would be able to have a more useful conversation with each person. Every attendee at the trade show spent big money to be there and is working on pressing problems that need to get solved. How they spend time on the trade show floor can make or break the success of their year. Of course, many successful people manage this type of today in a different way. Remember the scene in The Devil Wears Prada where Miranda attends a big event with her assistants, Andy and Emily, at her side, ready to feed her the notebooks full of information they had committed to memory about the names and faces of attendees? Of course, live events just scratch the surface of how wearables can add value. A quick look at the distribution center or manufacturing floor provides other avenues to usefulness. 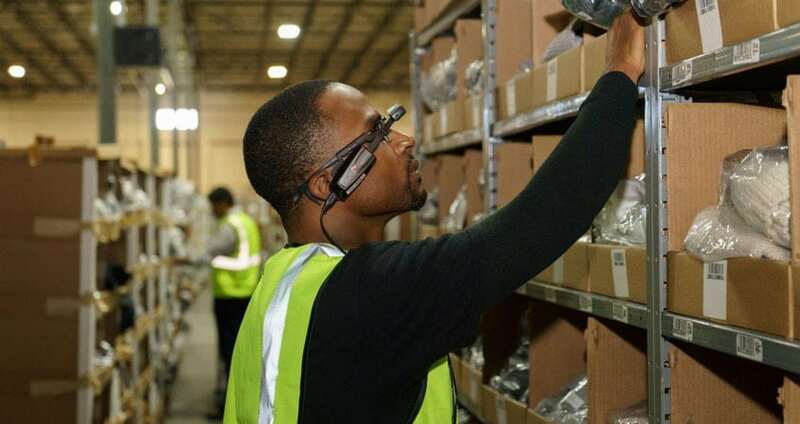 The distribution center managers could walk around wearing the glasses and see the locations, SKUs and quantity in each location in an augmented reality type of display. The intelligent software could highlight exceptions: empty locations, locations with replenishments coming in, locations running out of space, location of excess quantity, etc. In addition, these capabilities will help identify scenarios where the physical reality does not match what the warehouse management system shows. Just by doing a walk through around the facility, the manager would be able to pick up anomalies by comparing what the system thinks to the real inventory level. Training mode: In this mode, the new hires or the temp workers could be exposed to the procedures they need to follow by following a set of instructions displayed in their glasses. A trainer would be available and talk to the trainee through a headset, walking the trainee through the procedure and providing feedback. The trainee would able to see the trainer through his glass, but the trainer would also able to see the trainee and his actions. This visibility would allow the trainer to guide the trainee about how to be as ergonomic as possible. Execution mode: In this mode, the operators would execute the procedure on their own with an augmented reality based set of instructions visible in the glass wearable. The operator would have the option to record his actions so that the supervisor do a motion study to provide guidance and feedback.